THE POPE HAS EXCOMMUNICATED AN ARCHBISHOP FOR COMPROMISE WITH THE MOONIES – TIME FOR EVANGELICALS TO GO AND DO LIKEWISE? I’ve had some interesting/disturbing experiences with the Moonies and their leadership over the years. I’ve also had some interesting/disturbing discussions with various Evangelical leaders about same. Rev. Moon not-so-modestly calls himself “The Lord of the Second Advent.” He claims Jesus failed in his assigned mission to marry and have children, but he, Rev. Moon, rectified that for the human race by having 12 “perfect children.” Some babysitters reportedly described them instead as “perfect brats.” One son was killed in an automobile accident. Rev. Moon caused lots of embarrassment by the various Evangelical leaders who had apostatized to his camp once the money became attractive enough, when he decided an African man with psychopathic tendencies was his dead Korean son -- "Lord" Heung Jin Nim, back from the dead. Dutiful followers had to take many severe beatings from this man, including his USA interpreter and Washington Times head, Bo Hi Pak. Well, a few years ago, an African Roman Catholic archbishop succumbed to Rev. Moon’s heresies. He took a Korean acupuncturist wife in one of Rev. Moon’s mass marriage ceremonies. He left the marriage – for a time – under Vatican pressures to maintain both proper Christology and celibacy. Reported Evangelical and/or Conservative Catholic leaders succumbing at times to Moon’s financial, if not spiritual temptations, included Jerry Falwell, Richard Viguerie (also reportedly in Edgar Cayce New Age circles), Ron Godwin, Robert Grant, Tim LaHaye, Don Sills (who further compromised with the Scientologists as well as Moonies) and even Hal Lindsey had his moments of flirtation. Falwell’s embraces of Rev. Moon were particularly noxious to the Christian community. Well, there has been a lot of popular and sometimes even Christian press screaming at Pope Benedict XVI (the former Cardinal Ratzinger) this week. However, today, he did something Evangelicals could well emulate. He cleaned house of the Zambian Rev. Moon defector, excommunicating Zambian Archbishop Emmanuel Milingo. I had an argument with a popular Evangelical leader in 1986, the name of which would greatly surprise you. He told me it was ok to take Unification Church money to help build God’s kingdom. The rationale was that “the devil has had the money long enough.” I told him and stand by same that “God does not need 25 cents of Rev. Moon’s money to build his kingdom. Whatever Rev. Moon has given you, even if it saved a mortgage on your Christian School or financed new church buses, it isn’t worth your members’ souls. It is time to purge this bit of un-Christian leaven from our midst. Sorry to be away this long, but I’m completely redoing my CD in continuous video form with voice-over and film clips. As soon as it’s done, you’ll see me as I look now. That has occupied my time, but if you view Herb Peters’ site (or watch the news) you know that things are happening FAST, the “Alliance of Civilizations” and “Clinton Global Initiative” are rapidly advancing their anti-fundamentalist agendas, and war continues in the Middle East. As friend Herb Peters says, definitely stay tuned! Javier Solana Still Speaking for World? Javier Solana: Still speaking for the world? That moon over Michigan sure looks pink to me tonight. As such a moon usually stimulates me (just kidding about the moon stimulation! ), I go and see what Javier Solana is currently up to. No special reason apart from that. But he sure still seems to be THE SPOKESMAN for the world, or at least for the United Nations Security Council. Javier Solana says there will be no sanctions against Iran “as long as talks continue.” Now, since the USA has made it clear that they, above all else, desire that their designated spokesperson (Solana) be the sole channel that Iranian proposed deals come through, and since he, Solana has now made it clear, even in the express USA demand that there now be sanctions against Iran for missing their deadlines; but Solana says, NO SANCTIONS, as long as Iran is still talking [to him], it’s getting pretty clear who is boss and it isn’t the USA’s George W. Bush. In the meantime, his conferring allies on the Alliance of Civilizations and implementation of the Helskinki Process are busy making plans to have even local churches submit to a UNAOC (United Nations Alliance of Civilizations) snoopervisory, oops, supervisory organization. Read something here and better still, “google/yahoo” it for yourself! Well, I think I’ll walk outside and take another look at that moon, surely not . . .! NEW EU MEASURES AGAINST TERROR? NEW EU MEASURES AGAINST TERROR – BUT IS THE TERROR ALSO IN THE MEASURES? Well, it looks like September is starting somewhat rough for Dr. Solana. He is getting criticism on his “secretive handling” of the Iran issue by his 25 member states. Read about it here. However, he might have something to smile about. 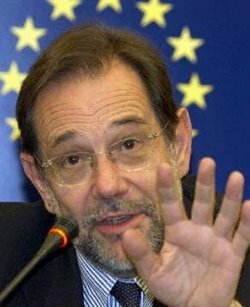 The European Union (e.g., Javier Solana) is releasing a “Green Paper” on terror-mitigating measures. Read about that here. In addition to banned substances on travel vehicles, it seems they now have to clamp down on literary fuel on the internet. Academics might have restrictions placed on their internet paper releases. Travelers might be screened for viruses. As the repressive measures continue, both here and there, it’s getting increasingly hard to say which is scarier: the terrorists, or the crisis=opportunity responsive measures of those who were already anxious to curtail civilian liberties. It will be interesting to see the definitions given of “terror,” especially since Solana has recently so very plainly made it clear that he fears “religion and misuse of religion” above all else. Read about that here. As friend Herb Peters says, stay tuned! EU Observer, September 2, 2006, article by Mark Beunderman.